Province aims to open another lane of Nipigon bridge by end of Feb.
Ontario's minister of transportation says he's confident the province will be able to re-open the Nipigon River Bridge to two lanes by the end of February. The four-lane cable-stayed bridge has been reduced to one lane since reopening to traffic after the failure of the structure earlier this month. The bridge is part of the Trans-Canada highway and connects east and west travel in Ontario’s north. 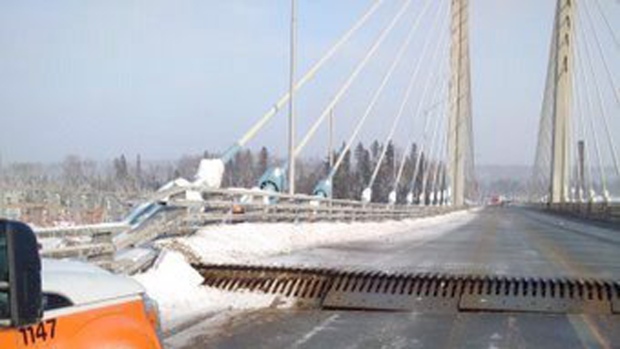 Part of the bridge's steel decking separated and rose about 60 centimetres on Jan. 10. This week, two independent labs started work to determine what caused the bridge to fail. Transportation Minister Steven Del Duca said, during a teleconference on Monday, that in order to complete the work temporary short-term full closures of the bridge will be necessary during off-peak hours. Del Duca said, since the bridge has been reduced to one lane, the average wait time to cross the bridge has been between five and 10 minutes.